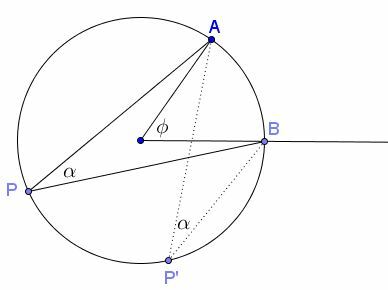 In a circle the angle at the center is double the angle at the circumference when the angles have the same circumference as base. 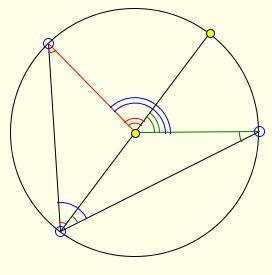 An important corollary of this fact is that, in a circle, all inscribed angles subtended by the same arc are equal. The importance of the statement and the corollary is underscored by the inclusion of a less elementary proof that employs complex numbers in a classic book on advanced geometry of plane curves. Of course, additionally, the proof serves to illustrate basic complex number techniques. The proof is based on the following diagram.